When there is a danger of being exposed to an electric arc, personnel are advised to wear arc approved protective clothing. IEC 61482-2 is the overall standard that covers protective clothing against the thermal arc hazards of an electric arc. The IEC 61482-2 standard also covers various aspects of the garment design. This is a requirement for selling garments for arc flash protection within the EU. 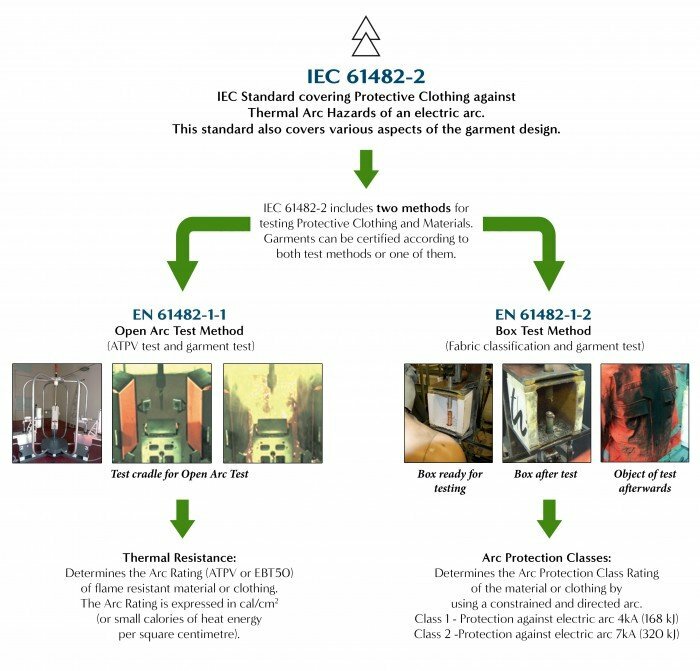 Garments complying with all of these requirements outlined under IEC 61482-2 should be marked with the IEC 61482-2 symbol as well as the level of protection it meets. During an arc blast, the radiation, flames and metal splashes from the electrodes connect with the fabric of the garments being worn. The temperature of an electric arc can reach intense heat of up to several thousand degrees. The fabric must provide sufficient insulation and shielding to the wearer to prevent second-degree burns to the skin. IEC 61482-2 includes two methods for testing Protective Clothing and Materials. Garments can be certified according to both test methods or to one of them. IEC 61482-1-1 is the Open Arc Test Method. It determines the Arc Thermal Protection Value (ATPV level) of the garment. The basic principle is that the ATPV of the garment must be higher than the Arc Flash energy level as calculated. The Arc Rating is expressed in cal/cm² (Calories per centimetre square). It is important to ensure that all garments have been tested fully and satisfy all the requirements of IEC 61482-2. It is important to note that the requirements of the IEC 61482-2 standard do not address electric shock hazards. IEC 61482-2 is applicable in combination with other standards that cover such hazards. We can supply test certificates for all of our garments on request.